Over this weekend, media personality, reality star, actress and cosmetics brand owner Lala Anthony was spotted partying at Reign nightclub in Atlanta. Rapper Young Jeezy, party promoter Alex Gidewon and Lala’s usual entourage who consist of her brother Diego, cousin Dice and best friend Po were also in attendance. For the event, Lala styled in a pair of Christian Louboutin Thigh High Suede Boots paired with a relish green and black sequin dress. Ladies, would you party in the outfit that Lala is wearing? For Thanksgiving, Chris Brown and Rihanna jet-setted to Berlin and spent the holiday together. 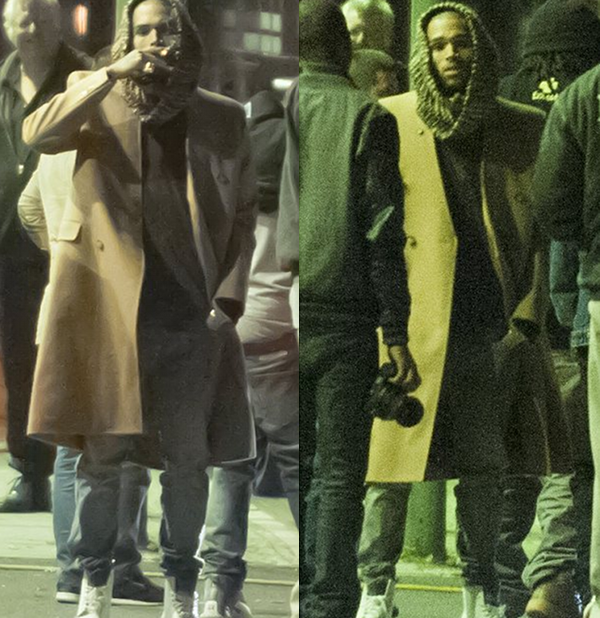 While in the capital city of Germany, Breezy styled in a Maison Martin Margiela x H&M Trench Coat in brown, which is from the brand’s 2012 Fall collaboration collection. This wool trench coat arrived at H&M retailers on November 15. It is being reported that H&M still has this coat in stock. 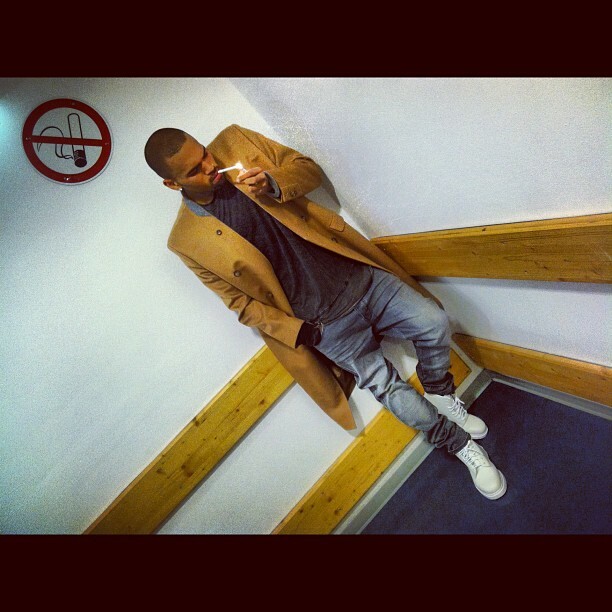 Breezy paired his coat with a grey sweater, blue jeans and white sneakers. 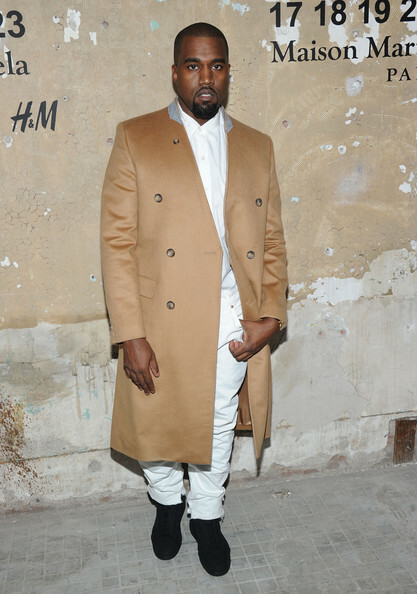 Last month, Kanye West attended H&M x Maison Martin Margiela’s collaboration event. He also styled in H&M x Maison Martin Margiela Trench Coat in brown. Yeezy paired his coat with a white button down shirt, jeans and $650 black Maison Martin Margiela Line 22 High Top Velcro Leathers Sneakers. 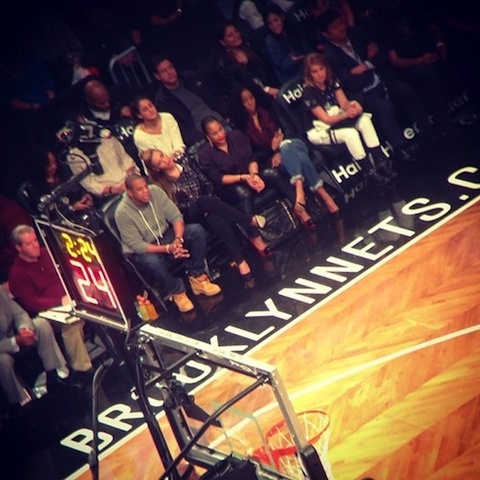 While some people in the states were standing in long lines trying to catch the ‘Black Friday’ sales, Beyoncé, Jay-Z, Kelly Rowland and Angie Beyince were sitting courtside at Brooklyn’s Barclays Center for the Nets vs. L.A. Clippers game. I bet traffic across the Brooklyn Bridge was backed up all day Friday. I take the train when I go to the Barclays Center. 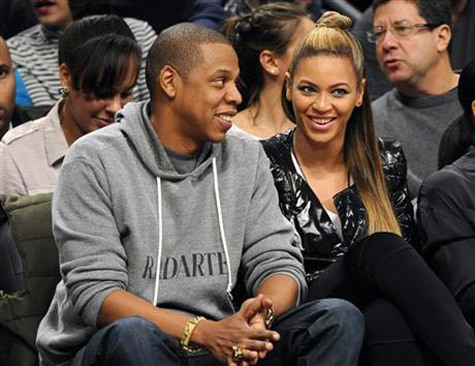 Jay kept it casual in a grey Rodarte hoodie, jeans and Timberland boots while Bey styled in a leather quilted biker jacket. Singer Mario performed the national anthem. The final score was 86-76, in favor of the Nets. 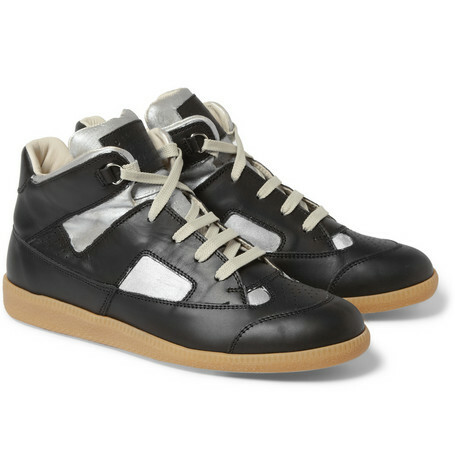 I’m obsessed with these $740 Maison Martin Margiela Painted Panelled-Leather High Top Sneakers. The Christmas holiday is approaching and I wouldn’t mine adding these bad boys to my wish list. 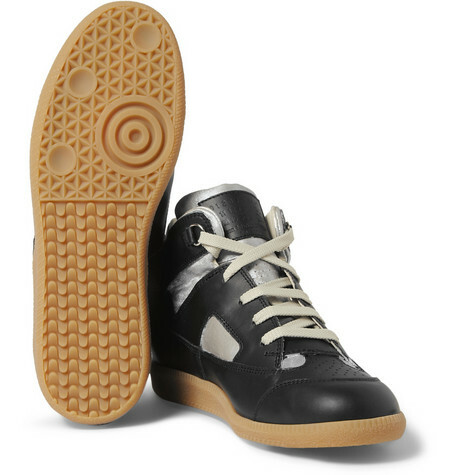 This version features hand-painted silver sections, black trimming, printed logo on the tongue, grey laces and a brown rubber sole. 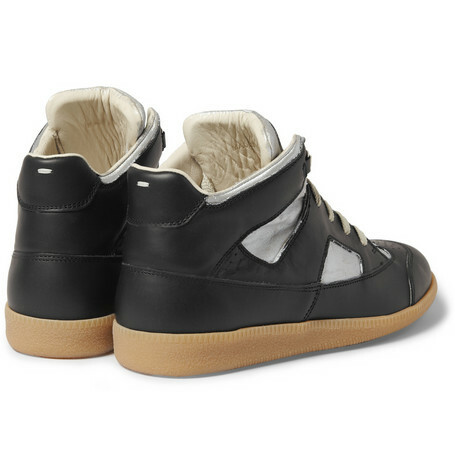 With these sneakers, I will wear a pair of $680 Men Biker Double Zip Velvet Wax jeans with a grey or black hoodie. Are you obsessed with these sneakers and how will you wear them? 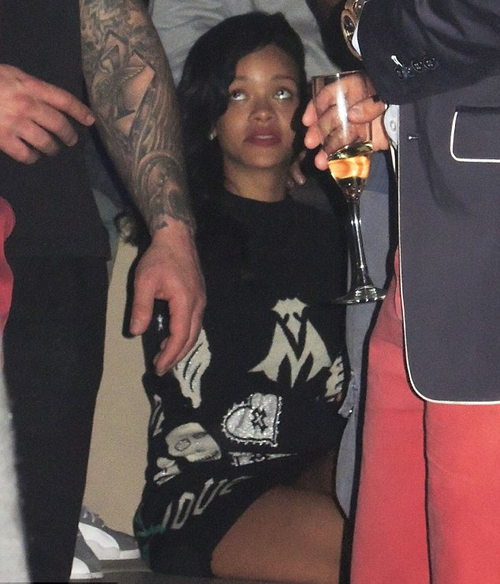 Rihanna and Chris Brown jet-setted to Berlin and spent the Thanksgiving holiday together. 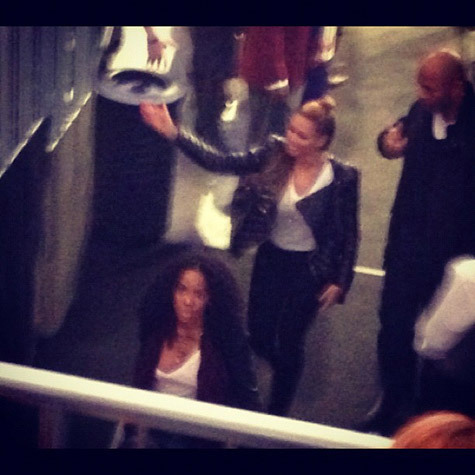 I’m not sure if the two are dating or just working on rebuilding their friendship but the twosome was spotted leaving Breezy’s ‘Carpe Diem’ concert at the O2 Arena in the capital city of Germany. After the show, it’s the after party, and to celebrate, Riri and Breezy headed over to Club Adgio from some drinks and fun. Do you think Riri and Chris should get back together or just be friends? While on the red carpet at this year’s American Music Awards, Roc Nation rapper J Cole chatted with Billboard. During his interview, the St. John’s University alumni talked about his new single “Miss America” and how wanted to “change the conversation” in mainstream Hip-Hop. 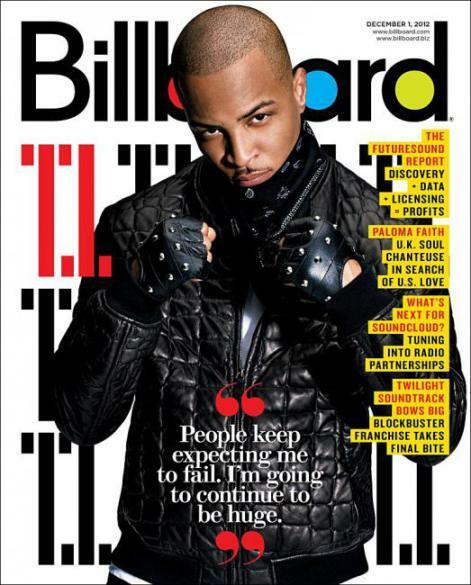 The track is featured on his sophomore album, Born Sinner. The single received mixed reviews from music critics and Cole himself admitted that he is taking a risk with the release of the track. A January 28th (J. Cole’s birthday) release date was set for Born Sinner, the follow-up to Cole’s gold-selling debut album, Cold World: The Sideline Story which debuted at number one on the Billboard 200 chart and sold over 217,000 copies in its first week. 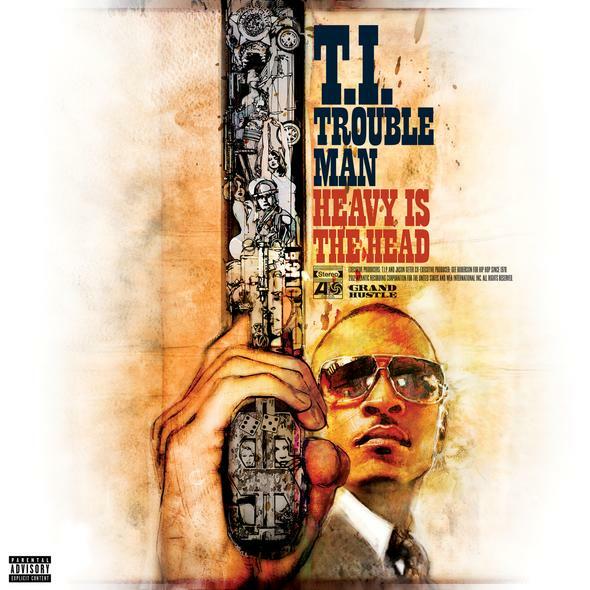 However, the album may not be hitting stores until after that date. Cole’s sophomore album may be pushed back because he plans to work on different branding opportunities to coincide with the album as well as a short film–“something way more expansive than a music video,” he claims — that will begin shooting in December. 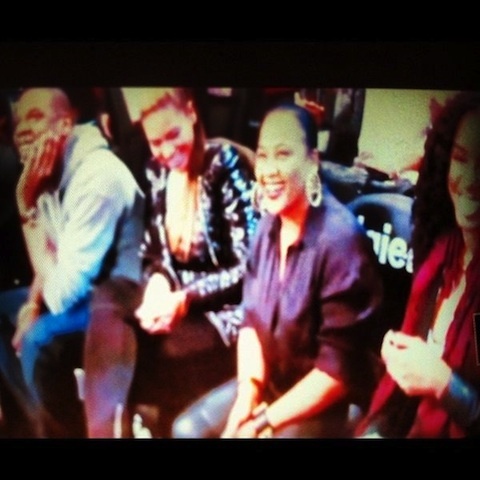 R&B/Pop singer Beyoncé recently took to her official Tumblr and released new pictures of herself, Baby Blue Ivy and Jay-Z. 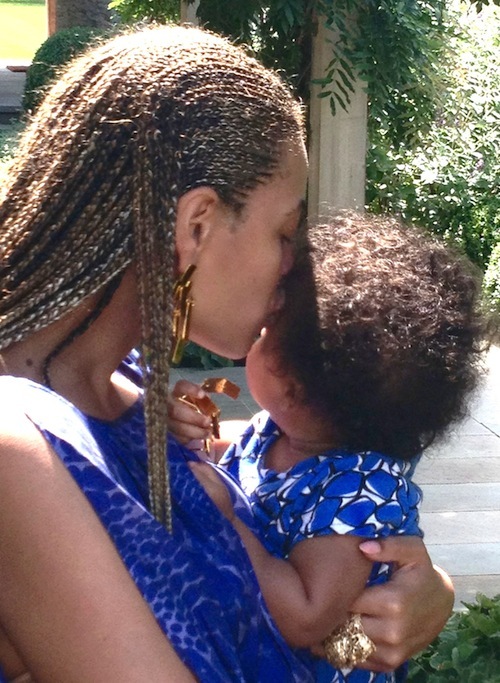 In the pic above, Bey is rocking long cornrow braids and giving kisses to her daughter. In the photo below, Jay is taking a walk through a garden as he carries Baby Blue. One day, we shall see Baby Blue face in its entirely. Her 1st birthday is just under two months. 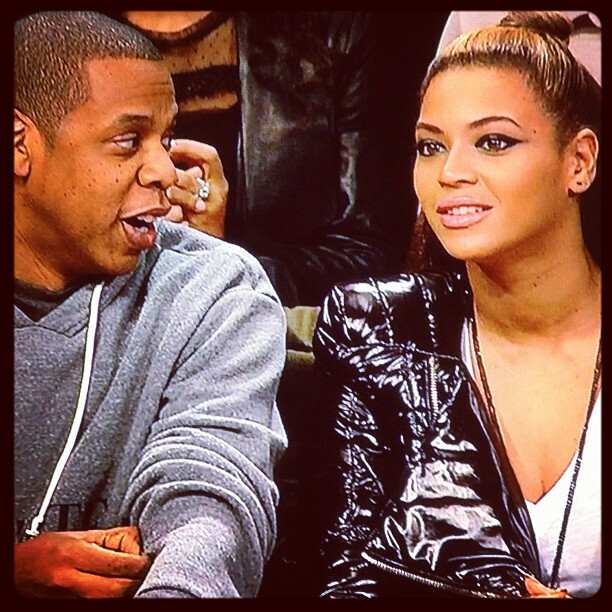 How should the Carters celebrate Baby Blue BIG 1?